My work explores the ephemeral importance of the Greek cafe, corner shop and milk bar, icons of suburbia that appeared with Greek migration, only to disappear with franchised fast food. Influenced by the representations of the purity and elegance of the everyday by Walker Evans and Paul Strand, my photos became self portraits, referring to my physical surrounds since early childhood. 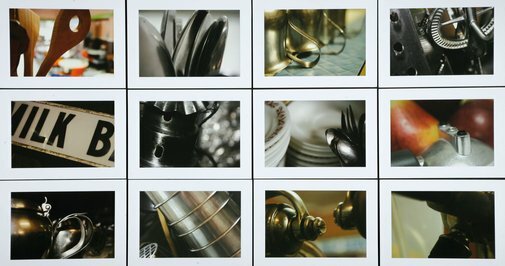 I focused on a physical connection to my family’s past by emphasising the importance of recognisable symbols of the cafe – the metallic machinery, utensils and crockery. These ordinary objects are given new meaning through an intentional approach to photography – using close-up filters, the macro setting, shallow depth of field, cropping and carefully placed focal points.